“Abdul! Are you enjoying the views,” he asks me in his thick, Quebecois accent. “I’m trying not to!” I bark back at him, just barely managing not to suppress a barrage of foul language. Cedric, my guide, watches on in amusement, a thick smirk covers his unshaven face. 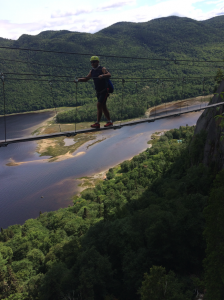 I’m balancing on the narrow beams of a hanging bridge, 85 meters long but only 20 cm wide, some 150 meters above Saguenay fjord (280 feet, 8 inches and 500 feet, respectively). The scenery from up here is, indeed, glorious. As I fight to suppress the repeated rushes of acrophobia, I rehearse deep breathing exercises from my Ironman training days. Eventually, I manage to calm myself down enough to cross the bridge aerial death passage. 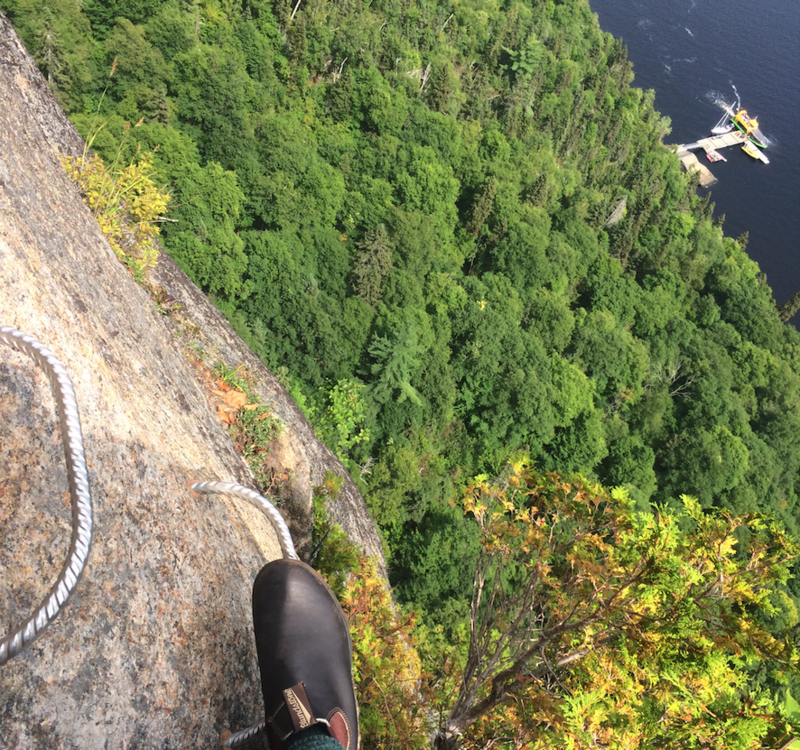 “Hell of a time to conquer your fear of heights,” I think to myself, as I clip my carabiner on a small metal ring drilled into the rock and scamper to a marginally wider ledge on the side of the mountain. I have just conquered the final challenge on my journey across the Via Ferrata, an intense rock climbing route carved along the open face of a mountain at Parc National du Fjord du Saguenay in Quebec, Canada. And I feel euphoric! 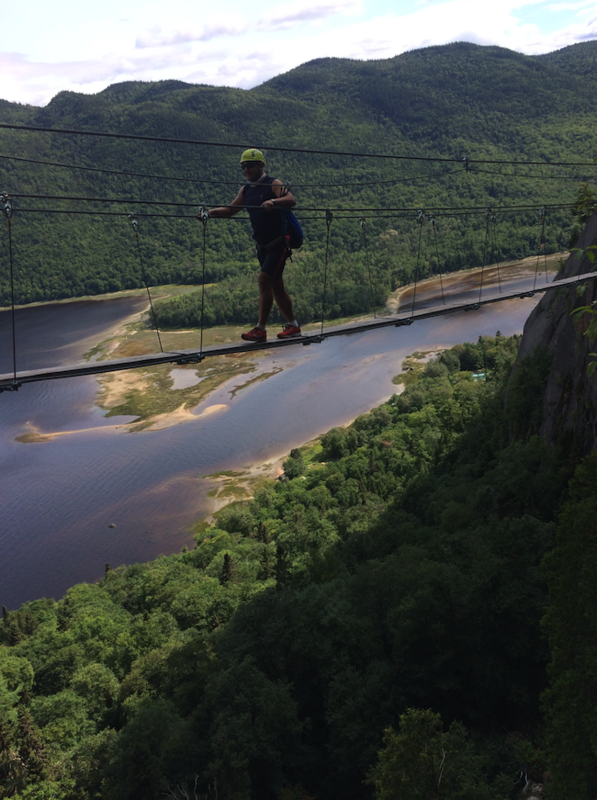 What a fantastic, adrenaline-pumping way to finish off four days of adventure travel in the Saguenay region. If you’re not familiar with a Via Ferrata (Italian for “the iron road”), it is a series of steps, pegs and small rings drilled into a mountain to create a threadlike path along the rock face. 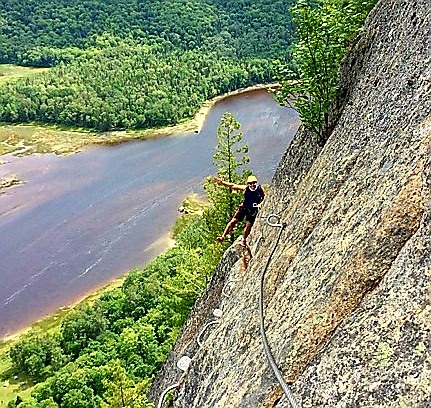 In Saguenay, adventure-minded souls climb to a height of 250 meters, clinging on to only the scanty hand and footholds, and often times simply balancing on their tippy toes high on the mountainside. 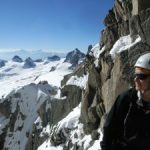 While climbers are provided with a steel safety cable along the way, there is absolutely no artificial assistance. The entire climb is done purely by balancing from one metal ring to the next. 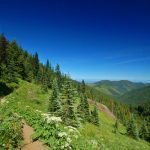 It is a high-intensity sport that is definitely not for the faint of heart, as safety carabiners have to be alternatively attached and detached every few steps along the entire route. One single slip could mean certain death so it’s important to remain focused. Conquering the Via Ferrata requires arm and core strength, stamina, flexibility and a good dose of strong nerves. Not having a fear of heights is definitely a plus as well! 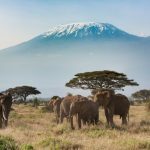 Our group starts out with 11 would-be climbers but is quickly culled to half as five individuals change their minds after the first 20 meters of climbing. A wise decision for many, as it turns out. For a fleeting instance, I admit, I also entertain the idea of backing out. Am I really going to be able to suppress my fear of heights? “What the hell,” I think to myself. “Just do it.” I decide to press on, drawing on my recent experience successfully navigating a tree top obstacle course to inspire me. As I scamper across narrow ledges, progressively climbing higher and higher, I slowly come to realize what I have signed up for. At one point, it is not so much the height but the complexity of the climb that starts to play with the mind. Every wicked obstacle is followed by another, yet more obscene challenge. 90-degree corners that must be rounded, ledges barely wide enough to position my toes, and a long balance beam to cross. All without the benefit of having any ground beneath me for 200+ meters. A moment of focus, a deep breath and I attack the challenge. Success! Time and again. As my confidence builds, I have to ensure that I don’t get too cocky. The moment you disrespect the Via Ferrata is the moment you pay the price. Upwards and onwards, I forge ahead. Directly above me, I come across an inverted ladder, forcing me to face out towards the fjord as I climb each rung. 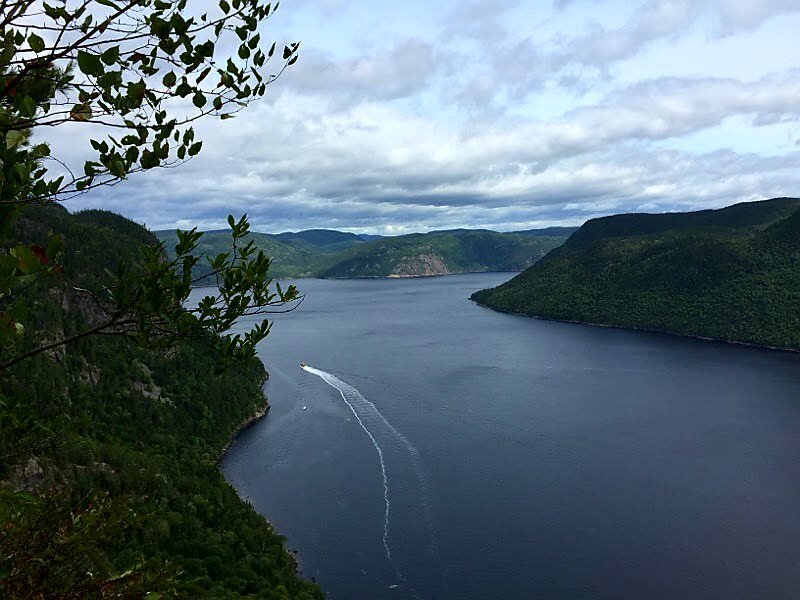 What a breathtaking view of Saguenay fjord! No wonder that they claim that this is one of the ten most beautiful Via Ferratas in the world. At the top of the ladder, a peek at the route ahead tells me there is still a long way to go. I’ll need to pace myself. Every movement is focused and deliberate, each breath timed for maximum efficiency. Perhaps the most difficult challenge yet, I encounter a 3-meter wide gap from one boulder to another, spanned by two steel cables. You guessed it, hold on to one cable and balance your way across to the other side of the cliff. Focus… deep breath… go! I find myself repeatedly surprised that I agreed to take on this challenge. Normally, anything to do with heights is enough to put me off. But every challenge has been mastered so far. I am flush with confidence and energy. Occasionally, I pause to take in the majestic views. Far below, the boreal northern forest paints the sides of Saguenay fjord with a lush carpet of green. Hikers far below seem like tiny ants from up here and kayaks remind me of colorful toothpicks drifting along in the dark water. 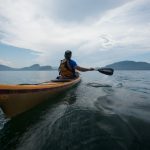 The water taxi on the fjord blows its horn – surely to celebrate my ascent? After a long day of climbing, our group has completed the course. And no one fell off the rock either! A look of pride and satisfaction graces our faces as we high five each other. Cedric leans over and inquires, ” Congratulations, my friend. Want to go again?” Nope, merci beaucoup! I’ll quit while I’m ahead, already looking forward to letting my aching muscles recover in the Nordic spa at Auberge des 21 in nearby La Baie. After a week of adventure challenges, it’s finally time to take it easy. 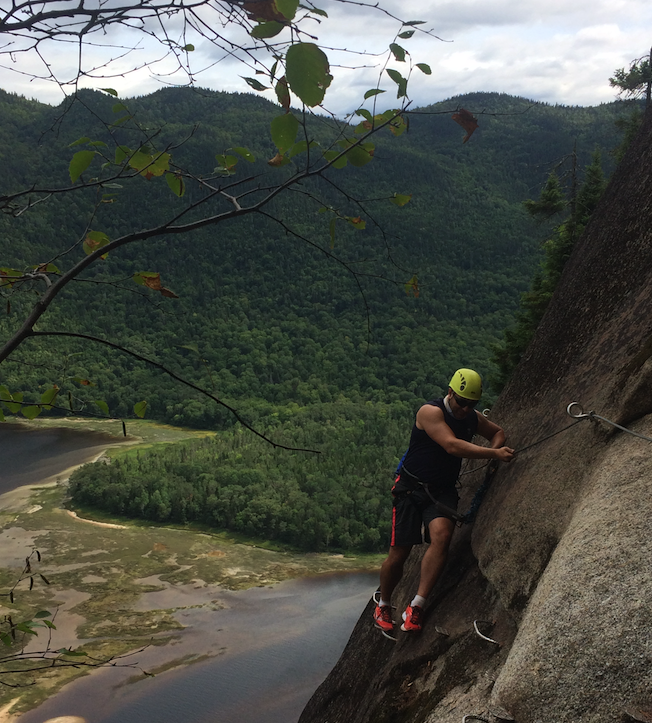 Parc National du Fjord du Sageunay is Quebec’s newest and highest Via Ferrata. Wow, I wouldn’t be able to do this but I enjoyed your account! I just got back from Quebec myself and can’t wait to plan another trip to explore more. Abdul has earned the nickname, Mr. Adventurer for his exploits here. Can’t wait to see what he does next.